It’s a gaming monitor. It’s a TV. Technically, it’s both. 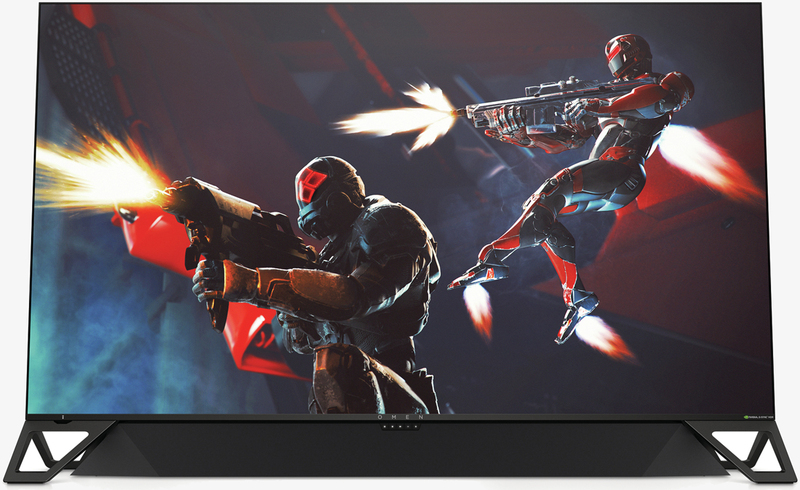 Meet the HP Omen X Emperium 65 display, a member of the Big Format Gaming Display (BFGD) initiative tasked with bringing TV-sized 4K gaming monitors with high-end HDR, variable refresh rates and Shield TV functionality baked right in. If that sounds desirable, well, it probably is. And I can assure you, it’s quite expensive. 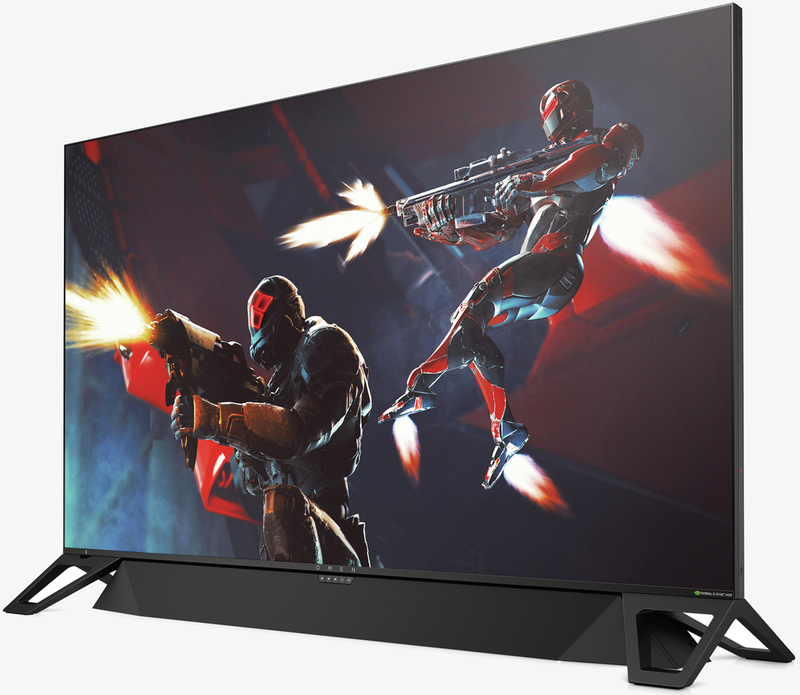 The display packs a 64.5-inch 8-bit AMVA panel boasting a resolution of 3,840 × 2,160, 750 – 1,000 nits of brightness (typical / HDR), a 3,200:1 – 4,000:1 contrast ratio (minimum / typical), 178° viewing angles, a 120 - 144Hz refresh rate (normal/overclocked) and a Gray-to-Gray response time of 4ms with overdrive enabled. HP says it supports 95 percent of the DCI-P3 color space. Other goodies include a custom-designed soundbar rated for 120 watts and an Nvidia Shield set-top box built right in, compete with remote. There’s even a handy light around the I/O panel to illuminate the connections when working in that area. About the only thing it’s missing is a TV tuner to connect your coaxial cable for free over-the-air channels. 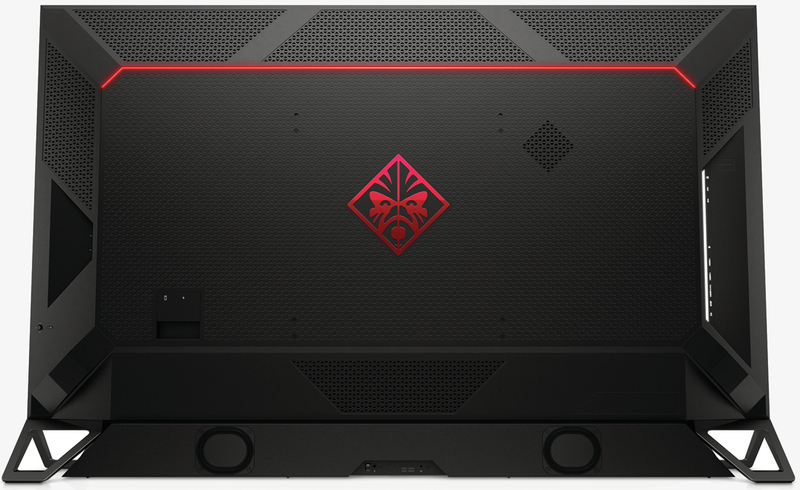 The HP Omen X Emperium 65 display goes on sale next month priced at $4,999. That’s an awful lot for a “gaming monitor” and still expensive for a high-end TV but for a device that serves both purposes, it’s curious at the very least. I thought buying a $530 monitor with 240 hz was insane. This is like switching my 4k 32” HDR monitor to 1080p resolution, for the same horrible pixel ratio. For so much money it should be an 8k monitor, then it would make sense. Extravagance and idiocy go hand in hand. ...[ ]For so much money it should be an 8k monitor, then it would make sense. No, then it would make absolutely no sense whatsoever. Unless of course, you're "the first kid on your block", to have a video card which would drive an 8K monitor to 100 fps or so. The rest of us would probably have to wait, say, five years or so, to have one of those cards. Although, two of those new RTX 2080s in SLI might make it happen. Who knows, it's anybody's guess. Why translate everything into FPS? There is work, Internet browsing, movies, and all that will work fine @8K with a single RTX 2060. It's intended to be a gaming monitor, that's the point. Do you really want to spend five grand for a monitor to shop online at Amazon? That's tragic.If it's for "work", buy a decent 4K monitor, and simply sit a bit closer. Forebode and Reehahs like this. As per my previous post, I already have it, a 32" HDR 4K monitor. If I buy a monitor that's 4 times in size, it better have 8K resolution, especially for 5 grand, otherwise there is no point. The only point to my posts is that its resolution and other features are specifically designed to be a gaming monitor. It wasn't designed for you specifically, that's your problem with it. If you don't like it, don't buy it. I think five grand is way too much as well, but I also think it's well thought out and specced out for its intended purpose. Which is to deprive a well heeled gamer of $5,000. I also think the aforementioned gamer would enjoy it immensely. It could be successfully driven with a single high end card, and it would simultaneously make all your friends incredibly jealous, erstwhile thinking you've completely taken leave of your senses. In that context, what's not to like? So why does it cost so much..? Nvidia ShieldTV ..? Why buy an expensive car if you don't care about the "benefits" ? you wouldn't.. so don't buy an expensive monitor? I know the car analogy isn't perfect.. there aren't limits against the customer in gaming. It's like an empty brag to state, why would I buy it because I already have X and I wouldn't use the benefit like play games and from further away. It probably cost so much because HP is having Samsung make it, and then selling with a 50% profit margin. Quantum dot TV's have a great picture and will probably outlast today's OLED's. A) $5k for a monitor??? Sheez, they should be selling this to the DOD. If I need/want another flatscreen, it will be LED for fidelity and durability.